The Lock Rail Set provides for an excellent parkland entrance barrier. Constructed from heavy duty steel uprights and pipe rail, the lock rail can be set at varying heights to suit local needs. The standard size allows for a 3.6 metre opening, but wider openings can be catered for on request. Supplied ready to install. A tamper resistant lock box is available to safeguard from illegal use of padlock cutting devices. 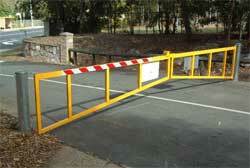 Designed to be highly visible this gate has a maximum span of 5700mm. Fabricated from zinc plated RHS Section the gates can be customized to fit any opening. “STOP” Signs are an optional extra powder coated yellow as standard. These brightly finished Banana Bars, that are strategically imbedded at the entry point of parks and such, restrict access to the type of vehicular traffic that is allowed to enter. The set distance can be varied during installation in accordance with the requirements set by the space governing body. 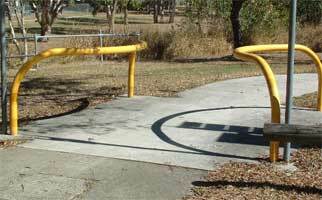 They are particularly suited to bikeway entrances. Once installed these items are virtually maintenance free. Powdercoat Yellow finish as standard. 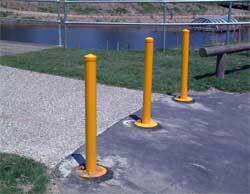 Bollards are an excellent method of providing a temporary, or removable barrier to parks to prevent access to vehicles unless authorised. Alkina International Pty Ltd manufacture a variety of these items for almost all exits, from the `in socket' fully removable Bollard to the 'hinged type'. All are constructed from steel and hot dipped galvanised, painted or powder coated finishes are options. 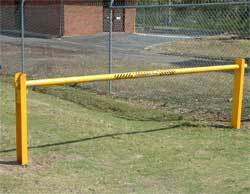 All removable Bollards are lockable.